Dental implants are growing in popularity, with the American Academy of Implant Dentistry estimating that some 500,000 United States patients get them each year. 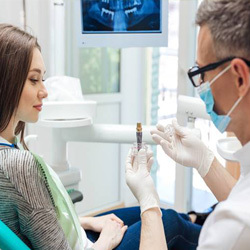 As implants become increasingly common, more patients are asking questions about implant dentistry -- and we have put together an implant FAQ to help. Keep reading for the answers to your most burning dental implant questions! A: OK, let’s start with the basics. 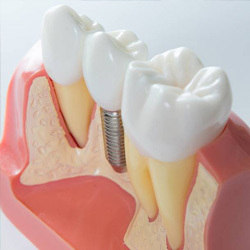 Dental implants are tiny posts that take the place of a missing tooth’s root. This portion of the implant is placed beneath the gum line in a surgical procedure. Here, it promotes the growth of bone tissue to help the post fuse together with the jaw. Then, a connecting abutment is placed on top. The prosthetic crown, bridge, or denture is usually affixed to this connecting piece one to two weeks later. Q: What are dental implants made of? A: Most dental implant posts are titanium, a sturdy material that the body accepts without issue. Titanium also encourages the bone tissue to grow for a sturdy foundation for the replacement teeth. Patients who are allergic or sensitive to metal may require posts made from ceramic or zirconia. A: In total, dental implant procedures usually take place over the course of four to eight months. The total length of yours will depend on your specific case and whether or not you need to have a bone graft procedure performed before implantation can occur. In some cases, Teeth In a Day may be possible with All-on-4 dental implants. A: The cost of dental implant procedures can vary widely based on factors like how healthy your jaw bone is, how many teeth you are missing, what your implant posts are made from, and other considerations. Your dentist will help you understand just what yours will cost and why during an implant consultation. Q: What are the benefits of dental implants? A: Dental implants offer a number of benefits, including improved oral and overall health, and a natural-looking tooth replacement as well as an improved diet, clearer speech, and more. When cared for properly, dental implants can also last a lifetime. No other option in tooth replacement offers as many advantages as this comprehensive method. Q: Who is a good candidate for dental implants? A: Thanks to a wide variety of options available, many adults who have lost or are missing teeth are eligible for dental implants. 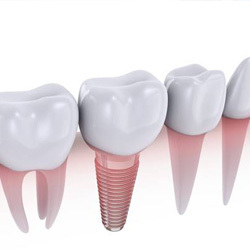 The only way to know for sure is to schedule an appointment with your dental implant dentist. Q: Where can I learn more about dental implants? 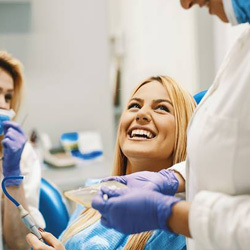 A: If you are interested in learning more about dental implants, including finding out whether or not you are a good candidate and how much yours might cost, is to visit with Dr. Fossum right away. Waiting to have your smile completed can worsen the effects of missing teeth -- so don’t delay! Schedule an appointment today.